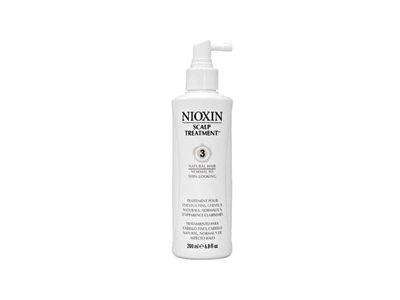 Nioxin Scalp Treatment 3 is a daily, leave-in treatment for fine, chemically-treated hair in the advanced stages of hair loss. Nioxin Scalp Treatment 3 is the last step of a daily regimen that is tailored for people with a particular type of hair, experiencing hair loss. Thethinning hair treatment delivers vitamins and nutrients to create a healthier scalp that will grow healthier and fuller hair. 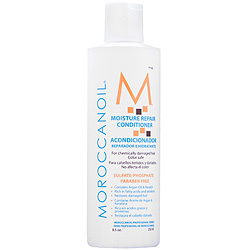 Nioxin Scalp Treatment 4 protects the hair and scalp fromUVA/UVB rays with SPF 15. The Glyco-fused complex in the thinning hair treatmentprotects hair color and keeps the scalp from drying out or getting irritated by chemical services. BioAMP thickens and strengthens the hair while the Unique Scalp Access Delivery System protects moisturizing nutrients. 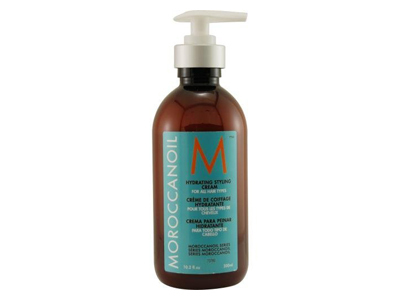 Use daily after Nioxin Cleanser 3 and Nioxin Scalp Therapy 3. Water, cocamidopropyl betaine, peg-12 dimethicone, isopropyl c12-15-pareth-9 carboxylate, glycoproteins, peg-23m, camellia oleifera, centella asiatica, cucubita pepo, dioscorea villosa, foeniculum vulgare, mentha piperita, prunus africana, rosmarinus officinalis, visnaga vera, vitis vinifera, lactobacillus/eriodictyon californicum ferment extract, lactobacillus/olive leaf ferment extract, lactobacillus/wasabia japonica root ferment extract, glycyrrhetenic acid, phospholipids, polysorbate-20, polysorbate-60, polysorbate-80, quaternium-51, hydrolyzed algin, hydrolyzed keratin, panthenol, cystine bis-pg-propyl silanetriol, acetamide mea, phenoxyethanol, ethoxydiglycol, hexylene glycol, hexapeptide-11, saccharomyces lysate extract, saccharomyces ferment lysate filtrate, betaine, dimethyl isosorbide, ppg-26-buteth-26, peg-40 hydrogenated castor oil, tris-oleoyltromethamine ethane sulfate, coenzyme a, pantothenic acid, pyridoxine, cyanocobalamin, biotin, folic acid, niacin, thiamine hcl, ubiquinone, carnitine, bioflavonoids, caffeine, algae extract, peg-18/18 dimethicone, tea-salicylate, saccharomyces/copper ferment, saccharomyces/iron ferment, saccharomyces/magnesium ferment, saccha-romyces/silicon ferment, saccharomyces/zinc ferment, sodium hydroxide, superoxide dismutase, dimethicone propyl pg-betaine, methyl nicotinate, melanin, tetrasodium edta, caprylyl glycol, chlorphenesin.